A friend of mine who works for a large nonprofit institution serves on a panel that’s trying to decide what the institution should think and do about social media. 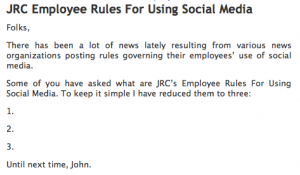 Should it encourage its employees and other stakeholders to use social media? Should it restrict what they say and do there? Or should it stay strictly hands off, neither aiding nor impeding social media activities? Cynics might argue that institutions inherently distrust anything they can’t control. But their challenge in dealing with social media has more to do with the culture of caution and conservatism that every traditional organization seems to engender. It’s one of the key reasons why the AP repeatedly feels the need to crack down on the way its staff use Twitter, and why Georgia Tech recently decided that federal privacy rules require it to ban classroom wikis. I can already hear the objections. But my point would be this: If you fear what your employees are going to do on social media, what you really fear is their humanity. Have courage. Fear and social media don’t mix.